The London food industry is fiercely competitive, so we designed a radical, innovative, Asian street food restaurant concept for multiple locations, the first at Crouch End Hill. Designed around an open central kitchen we used natural, reclaimed and recycled materials to achieve an atmospheric street feel, complimented by stunning graffiti from the renowned artist Milo. The brief was to create an Asian inspired dining experience that was capable of accommodating eat in, take out and delivery, all under the one roof. The business plan called for a design capable of accommodating eat in / take out / and delivery, in one space, and as if it had just landed from Asia. Add to that the flexibility to be implemented at up to 50 sites around suburban London. With the client and head chef we toured and researched relevant competitors, and together agreed the design strategy. Then we developed the design, ensuring the completed restaurant would meet the business objectives in a way that would produce an innovative, busy, and exciting experience for customers. The core philosophy of TOOTOOMOO is fast casual pan asian dining, with healthy food made to order, based around an open visible central kitchen. You can eat in, take out, or have your meal delivered. 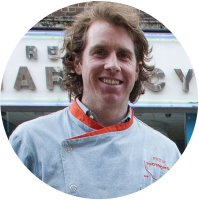 The simple reason I started is because I wanted to bring fresh, healthy, good quality, great tasting food to people. Designed around an open central kitchen we used natural, reclaimed and recycled materials to achieve an atmospheric street feel, complimented by stunning graffiti from the renowned artist Milo. Tootoomoo’s menu is a blend of Far East and South East Asia influences and the extensive choice of dishes are inventive and complex, with a combination of ancient and modern cooking techniques to creating an adventurous dining experience. Food and drink can be ordered by patron’s casually over the course of the night. Izakaya’s are known for their loose atmosphere and focus on sharing drinks, food and good company – a concept that completely matched Tootoomoo’s ethos.